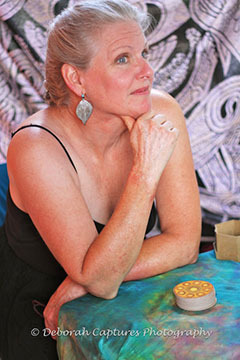 Madame Artemesia has been doing readings professionally for over 30 years. She got her first Tarot deck when she was a teenager. Her focus as a reader is to help her clients find positive paths and good ways to work with what they have. Madame Artemesia reads Tarot, Palms and runes at corporate and private parties as well as individual readings and you can easily catch her at the MD Renaissance Festival at the Ancient Mysteries Divination booth. Contact Madame Artemesia for an individual reading, party or event by emailing her at . Tarot reading is a form of divination (or telling the future and/or the present) by using cards that have pictures on them that show the "archetypes" of life or the basic symbols of our experiences (such as family, home, work, dissapointment, joy, love, etc.). Each reader has their own way of working with the deck. Palmistry or Chiromancy consists of the practice of evaluating a person's personality, past, present and future health, career, and relationships by interpreting information shown on the hands. Various "lines" ("heart line", "life line", etc.) and mounts show information based on their relative sizes, qualities, and intersections. Readers also examine characteristics of the fingers, fingernails, skin texture and color, shape of the palm, and flexibility of the thumb (and fingers). Madame Artemesia also reads the fingerprints which give even more detail. The runic alphabet is an old Germanic literary language, which were used in all of Northern Europe. In addition runes has always had a magic, prophetic meaning. Runemasters used them to practice magic on somebody, cure the ill, protect holy rituals and resurrect the dead. Runes also had an important role in making prophecies. From the very beginning each of the 24 runes in the alphabet had their own name. It is said that runes were also used to interpret omens from the gods, especially Odin. The legends the runemasters told, tied the runes to Odin. He appeared as a Shaman or a wandering wise man (even if he also was a warrior, lawgiver and lover of great capacity). He is described as wearing a cloak and a wide brimmed hat, one-eyed and with a blackthorn-staff. A legend about his life tells he spent 9 days and 9 nights in the tree of the universe, Yggdrasil, until he noticed some runestones on the ground. He reached for them in pain, grabbed them - and was released by the magic of the runes. One believe that the runemasters made their runes themselves by carving them in a rock, wood or leather. Afterwards they coloured them with magical ingredients, which at times can have contained blood. If they were consulted about a coming event, they spread the runestones on the ground. Only the stones which landed with the runeside up were interpreted. Madame Artemesia reads your runes in a private reading (she says "intensely private"). 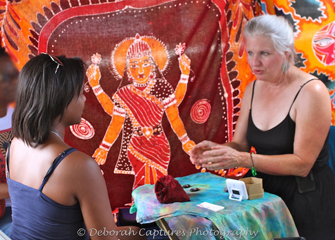 Schedule a reading with Madame Artemesia- contact her at 240-232-2707 or email her at: .